Reason for Reading: I saw it when I was browsing the shelves at the library, and picked it up because I’ve been enjoying the television game show Win Ben Stein’s Money the past few months. There’s nothing better than people that have brains crammed to bursting with random knowledge. 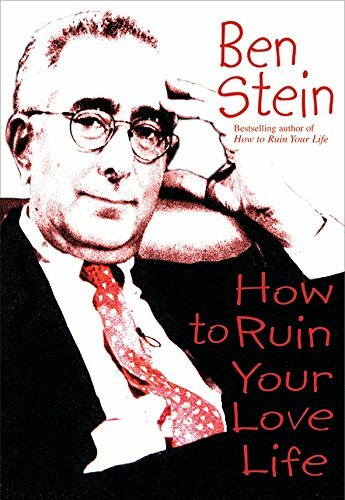 Synopsis: Jack-of-all-trades (master of quite a few) Ben Stein weighs in with a humorous book of tips for ruining your love life – keeping potential love interests terrified of dating you, driving away people you’re currently with, and ensuring anyone that does stay with you remains satisfactorily miserable. Why you should read this book: You could, of course, use the book as a how-to of the sleaziest and most cowardly methods of ensuring a break-up/lifelong isolation, but the preferable idea is to catch a glimpse of yourself somewhere in all of the bad behavior, stop dead in your tracks, and try to turn things around. The advantage to this method of writing is that it can be hard to implement positive behaviours outlined in other self-help books if you don’t know what terrible behaviours you’re supposed to be replacing. Stein does a nice job of outlining a problem and then getting specific in listing the particular conduct that comes with it, which is where the humour comes in – the whole “I’ve seen that from a previous boyfriend/girlfriend before!” feeling. Good for an hour or two of giggles. Why you should avoid this book: In a book that barely passes the hundred-page mark, you’d hope for as little repetition as possible, but there’s quite a bit here – apparently a large number of issues can be linked back to feelings of superiority and self-absorption. The book is also lacking in subtlety, which perhaps was the point, but it’s kind of annoying to wade through so many italicized phrases, exclamation marks, and hard-line words like ‘never’ and ‘always.’ Not to mention the word ‘you’ being used so many times you want to bang your head against the wall, as Stein chose to address the book directly to the reader (which also means as you read, you’re being accused of all of the outlined misdeeds). The tone might be a bit self-defeating if you’re the kind of person that digs in your heels when confronted with negative criticism. #1 – Know That Your Wishes Are the Only Ones That Matter in Any Situation: Something that you’re going to have to get into your little pumpkin head is that your lover basically exists to help you. He has no meaningful life indepenent of what he can do for you. Yes, your lover may have what some might see as personal interests, hobbies, needs, wishes, and fears, but those aren’t important. What is important, what does count, is what your lover can do for you. If he’s interested in playing tennis or buying antiques or watching the Tampa Bay Buccaneers on TV, that’s worthy of some tiny, passing notice. And if he has some desire to have a life that has some modicum of independence to it, that’s also interesting, ho-hum. You might acknowledge it with a cursory nod and a wave. What kind of fun is it if you have to share things? How is it fair to be expected to do as much for the other person as he does for you? I mean, how do you come out ahead in that situation? No, you’re owed everything you can get from the relationship, and in return, you’re supposed to give as little as humanly possible and still generate enough interest to get the gifts and attention and adoration. Don’t for a minute let your lover off the hook when it comes to appearance. That’s right. You can gain as much weight as you want and sport long, shaggy, goofy-looking hair. But make sure she knows that you expect her to look fabulous at all times. She has to diet, work out, have plastic surgery, dye her hair – basically do anything and everything to keep up the facade. And you don’t have to do anything but sit back and criticize. That’s your prerogative. Just be certain to really stay on top of the situation. Maybe tack up sample diets and exercise programs on the refrigerator door, or give her articles to read that you find in magazines such as Shape and Self about makeovers and liposuction. Also recommended: The Fabulous Girl’s Code Red by Kim Izzo and Ceri Marsh; In a Sunburned Country by Bill Bryson; A Cook’s Tour by Anthony Bourdain. Also by this author: The Real Stars: In Today’s America, Who Are the True Heroes? ;Â Yes, You Can Get a Financial Life! ; 26 Steps to Succeed in Hollywood…or Any Other Business; How Successful People Win; Yes, You Can Still Retire Comfortably! ; The Gift of Peace: Guideposts on the Road to Serenity; How to Ruin Your Life; How to Ruin Your Financial Life; Yes, You Can Time the Market! ; Moneypower: How to Profit From Inflation; Los Angeles; The View From Sunset Boulevard; Bunkhouse Logic; Yes, You Can Be a Successful Income Investor; A License to Steal; Michael Milken and the Conspiracy to Bilk the Nation; Hollywood Days, Hollywood Nights; DREEMZ; Financial Passages; Ludes . Fun tidbit: Stein has been a speech writer for Richard Nixon at The White House, but rest assured, he claims no responsibility for Nixon’s presidential misdeeds.